I got Nova’s “Fire Wars” video as part of my study of fire science. It is a great complement to the many books and magazine article. To actually see the flames and the firefighters at work, and hearing them speak adds greatly to understanding. If a picture is worth a thousand words, the video and explanation is worth even more. Seeing an example of the fire-ball that comes from a fire blow-up is much more impressive than reading about it. The video also includes computer graphics that shows in detail how the winds and topography interact. I read the classic “Young Men and Fire” about the fire in Mann Gulch that killed thirteen smoke jumpers in 1949, but could not picture and really understand the event until I saw the actual topography and the graphics that showed the fire’s progress. Nova does an excellent job of explaining the dynamics of firefighting and how wildfire has become an increasingly urgent issue. This program was made in 2002. If anything, the problem has become even more urgent. Knowing that adds to the tension you feel watching the fires. The video does an adequate job of explaining how we got into this situation. A lot of it came as a result of the Big Burn in 1910. This was disastrous fire that burned thousands of acres in three states and killed 78 firefighters. 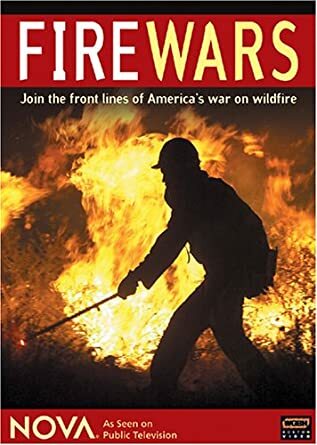 The Forest Service reacted to this by making fire the enemy, treating fighting fire as the equivalent of war and bringing in air and ground forces similar to an army at war. They won … sort of. For a half century the Forest Service excluded fire. Yesterday’s solutions are today’s problems, especially when they are based on wrong information. Fire is a necessary part of many ecologies. Many biotic communities are not only adapted to fire; they require it. Foresters first noticed the problem in the among the sequoias in California. Fire exclusion allowed the growth of a lot of brush and for many decades there were no baby sequoias. Fire was reintroduced and things improved. But it is not that easy. In the half century plus when there the Forest Service quickly extinguished fire, the woods have grown thick with trees. In the ponderosa pine ecosystem in the Rocky Mountains, for example, there used to be only about forty trees per acre. Today there are more than 700 in some places. None of these trees gets enough water and nutrients. Many die. In the old days, fires came frequently but they were small. In the new regime, they come rarely but they are big, big enough to kill the big old trees and hot enough to burn the soils, turning them into a hard type of pottery that cannot even take the seeds. But reintroducing fire is a problem given all the extra trees. We will have to do some mechanical thinning and harvesting and then introduce fire. But these procedures are controversial among some environmentalists, who fear and/or oppose profitable forestry activities such as thinning. I recommend this video very highly. For someone (like me) who is studying the subject by reading books, this video makes it easier to visualize a fire in the woods. For those just more casually interesting in the subject, this video is interesting and informative. This entry was posted in Book Reviews, Conservation & Environment. Bookmark the permalink.